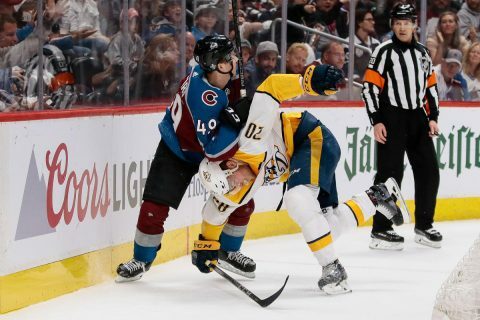 Denver, Co — The Nashville Predators advanced to the second round of the Stanley Cup Playoffs with a convincing win over the pesky Colorado Avalanche, 5-0. The victory sets up a premier showdown with the Winnipeg Jets, who experts are calling the series to watch. Nashville came out storming against the Avs early and often in this game. Mattias Ekholm lit the lamp first for the Predators at 7:02 of the first period when his snapshot beat Andrew Hammond for the early 1-0 lead. Austin Watson made it 2-0 at 10:19 of the first with a wicked wrister after an assist from Colton Sissons and Nick Bonino. The line of Watson, Sissons and Bonino was the highlight of the lineup in this game tonight. Filip Forsberg wouldn’t be kept off the scoreboard as his stellar series continued. His unassisted wrist shot just 38 seconds into the second period made the score, 3-0 and totally silenced the Colorado crowd. It was at that point that the game was tipped totally in favor of the Predators. Nick Bonino scored at 8:26 of the second period on a wrist shot the beat Hammond again, and the Predators led 4-0. Bonino was assisted by Callie Jarnkrok and Ryan Ellis. The final score of the night was a Viktor Arvidsson masterpiece, on a feed from P.K Subban at 2:36 of the final frame. There was never any doubt about the outcome of this one after that marker. Ryan Hartman was nowhere to be found in today’s lineup after serving a one game suspension from the NHL after a hit last week. Scott Hartnell was not in the lineup as well. Head coach Peter Laviolette has said he would juggle his lines after the disappointing loss at home on Friday night at Bridgestone Arena, forcing today’s sixth game. Colorado was the eighth seed in the tournament and gave Nashville all they could handle. Pekka Rinne stopped all 22 shots he faced today, while Hammond stopped 32 of 37 shots against. 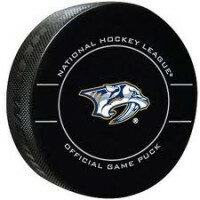 Game times have not been announced for the Winnipeg series, but the Predators will have home ice advantage throughout the playoffs after winning the Presidents Trophy for the most points on the season.